An easy gluten-free vanilla cake recipe that is tender and better than any bakery style gluten-free cake. You are going to love this gluten-free vanilla cake. This gluten free dairy free vanilla cake is a spin off my gluten-free vanilla cupcakes. You guys have been asking for the best gluten-free vanilla cake recipe and here it is! If you are more of a gluten free chocolate person you are going to want to check out my easy gluten-free chocolate cake. 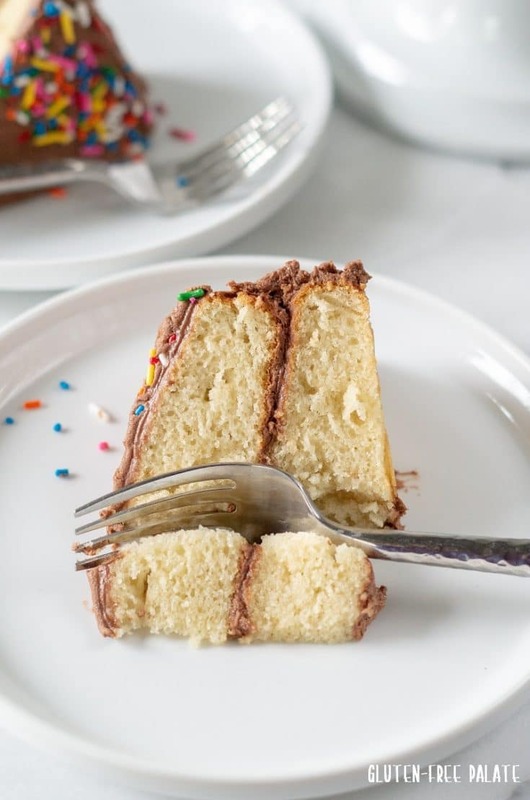 In case you were wondering, this gluten-free vanilla cake has the best texture. It’s light, tender, and it isn’t dry like many gluten-free vanilla cake recipes. Everyone agrees that this is the best gluten free vanilla cake. No need to ever buy a gluten-free vanilla cake mix at the store. 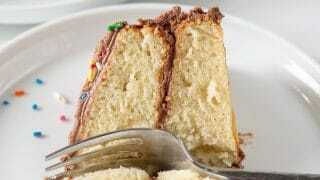 Several of my readers have been asking for a easy gluten-free vanilla cake recipe. I’ve had my gluten-free vanilla cupcakes up for a while now and they get raving reviews. Please read through this entire post. 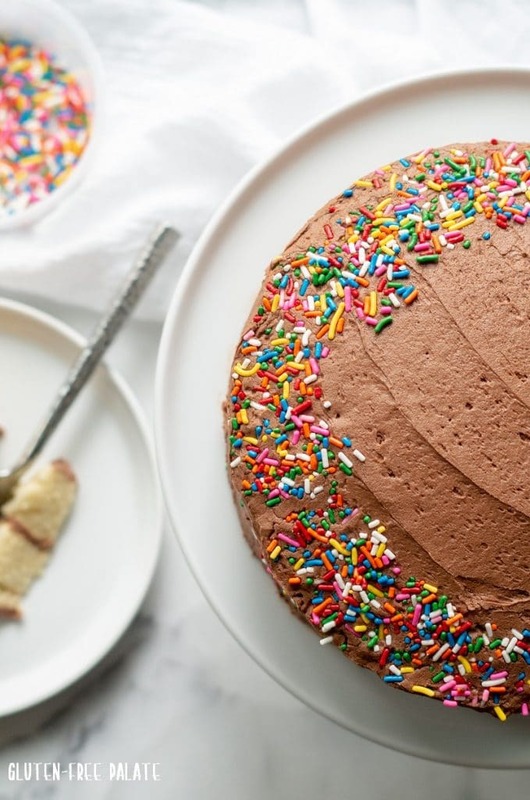 It’s chalked full of tips for making the best gluten-free vanilla cake. This gluten free dairy free vanilla cake recipe isn’t vegan. It uses eggs. If you need a vegan cake you can check out Minimalist Bakers 1 Bowl Vegan Gluten-Free Vanilla Cake. The other option is to use the equivalent of a flaxegg, but your cake texture will vary. There are a couple of tips and tricks to getting the right texture with this gluten-free vanilla cake recipe. First, you have to follow the recipe. So many people comment on recipe posts saying that they made a ton of substitutions and the recipe didn’t turn out. If you make a substitution, you are doing so on your own. Other than the dairy substitute, I haven’t tried other substitutes in this recipe. Make sure to preheat your oven before you begin. Add eggs and beat with an electric mixer at medium speed for one minute. Add flour, salt, baking powder, dairy-free milk, and vanilla; beat at medium speed for one minute. Spoon batter evenly into cake pans. Bake for 30-35 minutes or until the centers springs back when touched and cakes are lightly browned. Let cool in the pan on rack for five minutes. Remove the cakes from the pans onto rack and cool completely before frosting. 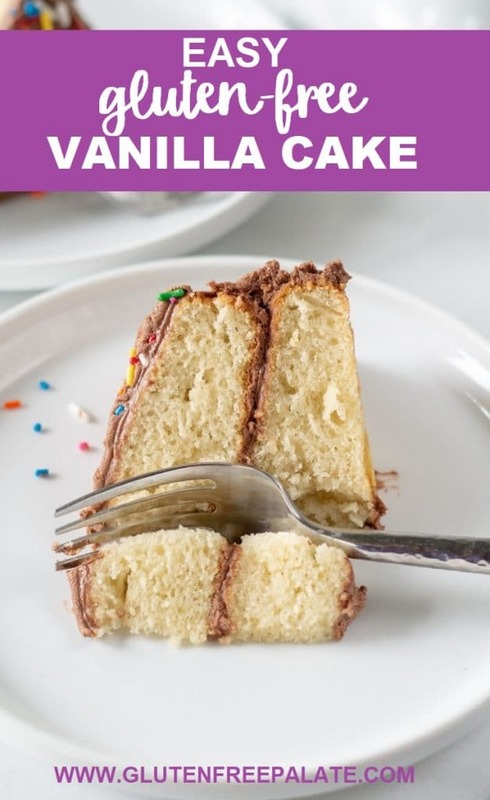 For the detailed instructions and ingredients for this gluten-free vanilla cake recipe please see the complete recipe below. Can I use dairy in this cake? Yes, you can use regular dairy butter and dairy milk in this recipe. Just note that if you use butter instead of oil in the recipe, the cake will be a little heavier. This isn’t a bad thing, it’s just a smidge more dense. You might see cracks if your temperature is too high, or your cake is placed in the oven too high. The heat of baking activates the baking powder and causes it to release carbon dioxide, which forms bubbles and raises the cake. If your oven is too hot, that process is sped up. Make sure to place your cake in the center, and regularly check your oven’s temperature. Another reason is if you are at a high altitude. If you are baking this gluten-free vanilla cake at a high altitude consider cutting the baking powder in half. Why did my gluten-free vanilla cake sink? There are several reason why gluten-free cakes sink, one is from over beating the batter and adding too much air. Also, cakes often will sink when there is too much moisture. This is more common in humid climates where added moisture can collect naturally in ingredients such as flour. When this occurs, the center of the gluten-free vanilla cake rises rapidly and then falls during baking. In higher elevations, the leavening agent works twice as hard and may cause the batter to rise rapidly and sink before it’s had a chance to set up. All these tips are relevant to most cake recipes, not just this gluten-free vanilla cake recipe. 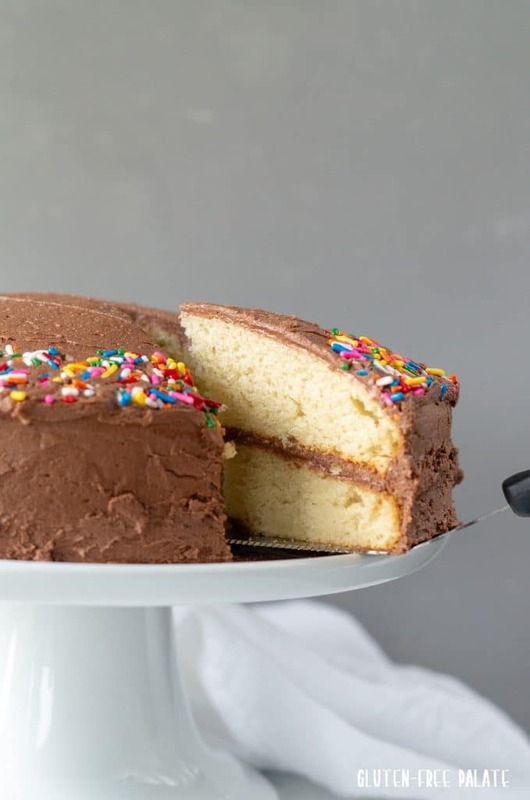 If you made this gluten-free vanilla cake recipe I want to hear from you! Please leave a star rating and a comment below letting me know what you thought. This helps me and other readers know that you liked the recipe. For the cakes: Preheat oven to 350°F (180°C). Position rack in center of oven. Grease two 8" or 9" pans with oil; set aside. This recipe works best with Bob's Red Mill 1-to-1 Gluten-Free Baking Flour. Room temperature eggs work best. To bring cold eggs to room temperature, run them under warm water for a couple of minutes. 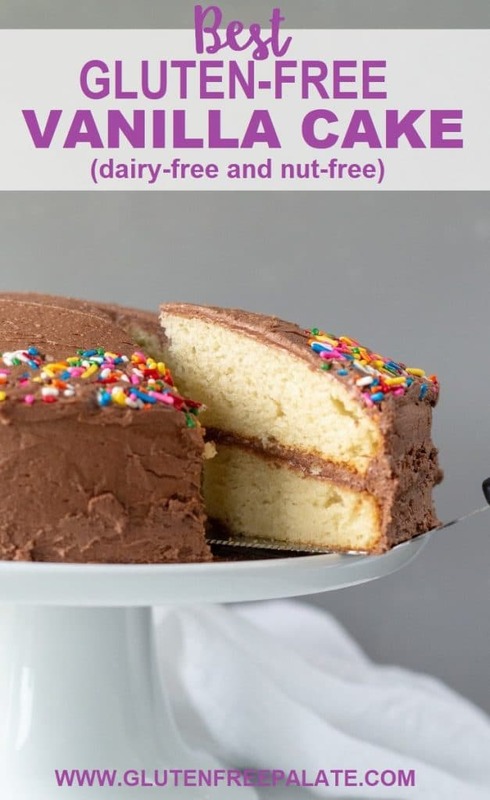 Dairy - you can use regular dairy milk and dairy butter in this gluten-free vanilla cake recipe. Can you tell me what ingredient you are trying to stay away from and I will see what I can do to recommend a blend for you? I made the vanilla cake for our Easter dessert. My family loved it. It did not have the texture of other gluten free recipes I have made and have already passed the recipe on. Thank you for developing it. I am so glad your family loved it! Thank you for taking time to stop by and let me know.